Environmental Benefits of Green Roofs In Commercial and Institutional Building - Jay R. Smith MFG Co. The roofs of our commercial and institutional buildings not only transform the buildings themselves, but the surrounding environment as well. Many architects today are including green roofs, also known as vegetative roofs or living roofs, in their designs. These vegetative or green roofs can have a significant positive impact on urban flooding, water quality, and watersheds because they reduce the volume and rate of runoff. While the report is two years old, much of the information in it is still very relevant to plumbing engineers and architects today. The report states that green roofs can form a key part of a site-level stormwater management plan, reducing peak flow rates by up to 65 percent and increasing the amount of time it takes for water to flow from a site into the sewer by up to three hours. They estimate that installing a green roof at least three inches thick on a large enough area can reduce the frequency of sewer overflows during the summer season. Much of this will depend on the type of plants grown, whether or not they need an irrigation system, the type of drainage layer used to eliminate excess water, and the growth medium or soil in which the plants are grown. The drainage layers will carry the excess stormwater runoff to the roof drains and then ultimately, off the roof. Getting excess water off a green roof surface is very important. The drainage layers, along with your additional roof drains, will prevent erosion and/or ponding of water. It will also ensure the sound engineering and structural integrity of the roof. Another important aspect of green roof design is irrigation. This is especially true for intensive and multi-use roof areas. By capturing rainwater, you can use it to irrigate either the green roof and/or surrounding landscaping. This also helps to reduce excess stormwater runoff and maintenance costs. 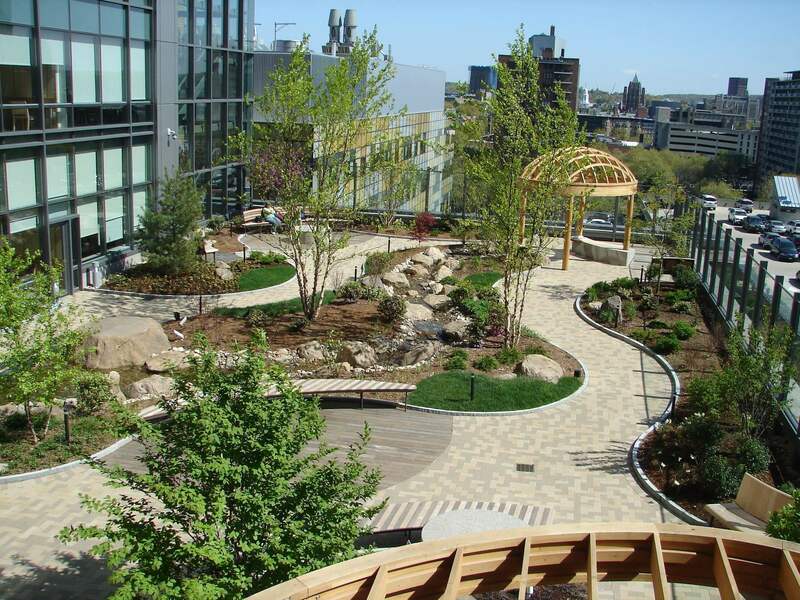 An article on the Whole Building Design Guide (WBDG) website points out that cities such as Seattle, Portland, and Philadelphia “advocate for a combination of LID (low impact development) practices including vegetative roofs." The article also mentions some municipalities, such as Chicago, “have taken the approach of mandating vegetative roofs on new building projects because of the host of benefits it brings to built-out urban areas. While still other cities are offering “substantial tax benefits and subsidies” for incorporating a vegetative roof into the design. However, some Western states’ water rights laws restrict how rainwater landing on a property may be used. The WBDG says that this rainwater is water-of-the-state. So be advised to check with your local municipality when planning your roof design. You can find more information on green roof drains and rainwater harvesting products on our website, or contact your local representative by going to our homepage and clicking on the Contact menu. If you will be attending the GreenBuild 2013 Conference in Philadelphia November 20-22, please stop by the Morris Group International booth #3725 and we can answer any questions you have. Have a question or comment about this post? Head over to the Jay R. Smith Manufacturing Facebook page and let us know.